To the north and east of Australia lie the islands known as Melanesia. These islands form one of the most culturally complex regions of the entire world, with 1,293 languages spoken across the Solomon Islands, Vanuatu, New Caledonia and the island of New Guinea (politically divided into Indonesia’s West Papua Province and the nation of Papua New Guinea). It is also a region of great antiquity. New Guinea has been settled for around 45,000 years, the Solomon Islands for 35,000 years, and Vanuatu and New Caledonia for about 4,000. Throughout Melanesia, people lived in small scale societies often without strong leadership systems. Instead, communities were bound by ties of family and by complex networks of trade and exchange. Trade routes could link distant communities, and trading canoe voyages covered extensive distances. The daily round of food gardening, hunting, and in coastal areas, of fishing, were enriched by many rituals, often involving the production of remarkable objects such as the famous malangan carvings of New Ireland, and body decorations. In general Melanesians do not worship gods, but acknowledge the spirits and other beings sharing the landscape with them, and their ancestors. Europeans first passed by these islands in the late sixteenth century, but sustained contact only began in the mid-nineteenth century. 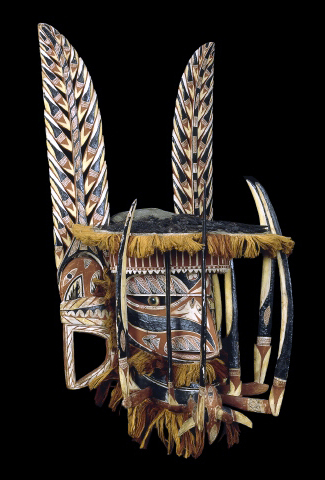 The British Museum collections date back to some of the earliest voyages in this later period of contact. The Museum continues to collect, adding objects which reflect the contemporary development of the three independent nations and two dependent colonies now in the region. Cite this page as: The British Museum, "Melanesia, an introduction," in Smarthistory, March 1, 2017, accessed April 21, 2019, https://smarthistory.org/melanesia-an-introduction/.